I should have posted this WAY earlier – but I forgot – call it a brain fart or whatever – but there is a damn great review by one of my favorite issues of What If? reviewed by site visitor Zeno – originally posted on Daily Pop’s site! Lasermatch made this Keown inspired sculpted piece of metal. They made it for Marvel’s 35th anniversary in 1997. I actually didn’t pick this up in 1997 – instead I waited. And the wait was worth it – I picked this up for $10 on ebay. Retail for this back then? It was either $39.99 or $49.99 – either way – glad I picked it up on ebay years later! I see the Keown influence - do you? I think this is a unique piece – maybe not all that rare – but certainly something that grabs your attention when you walk into the Hulk room. Even with all of the Hulk in there – this piece stands out. 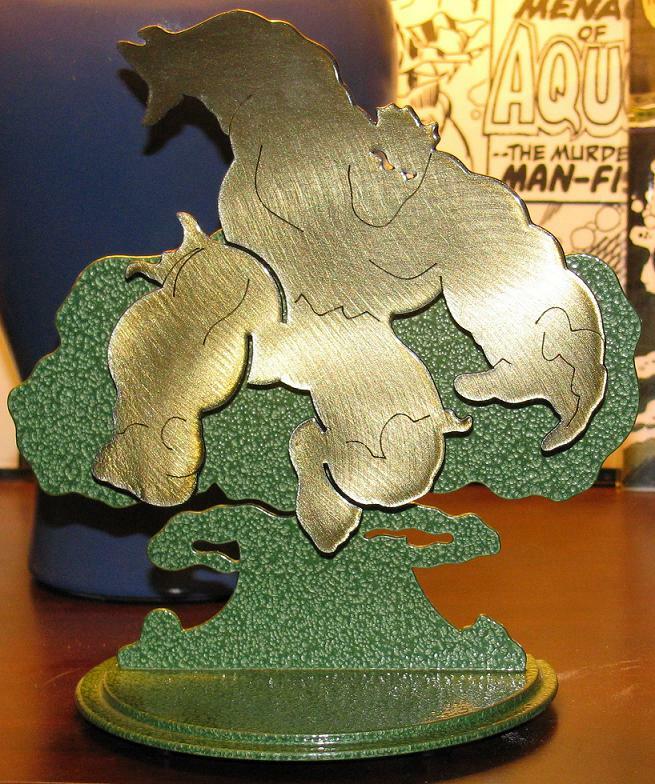 I just saw the FF one they did – I am thinking about picking this one up because it’s just so incredible! Galactus vs the FF – it doesn’t get much better than that! Well, except for Hulk, of course! A Sealed Bottle of the 2003 Hulk Chocolate Syrup! 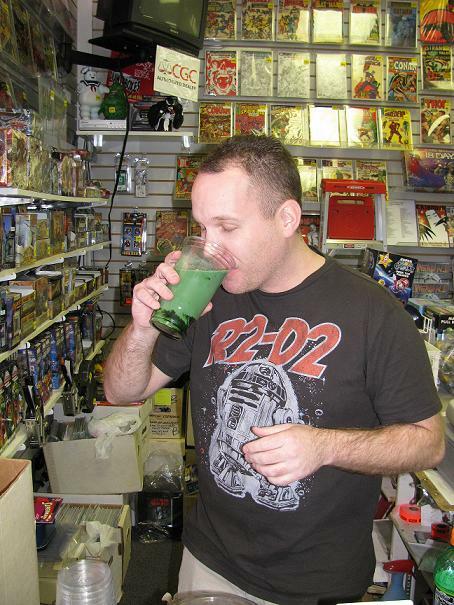 This trip to NJ was a blast – and one of the things that actually made me remember being a Hulk fan! Quite a few things happened this week, by the way, I hope every US fan of this blog had a wonderful Thanksgiving as well! 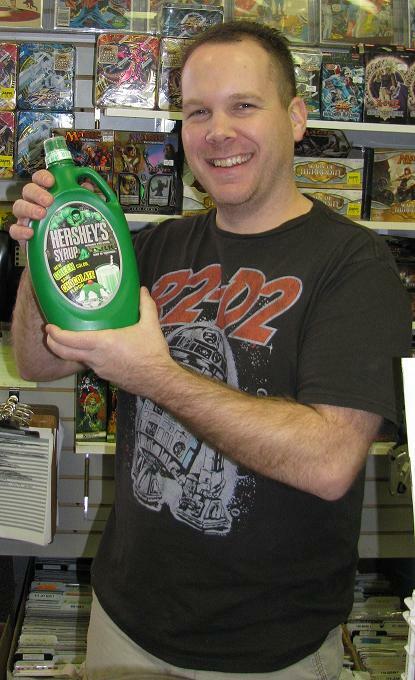 Now, last time I posted I told you guys that I was able to snag a bottle of the 2003 Hulk Hershey’s Syrup off of ebay. I told you of my intent to partake in a glass of 7 to 8 year-old chocolate milk with one of my closest friends, my friend Corry. This is a $2.00 Bottle of Happiness! 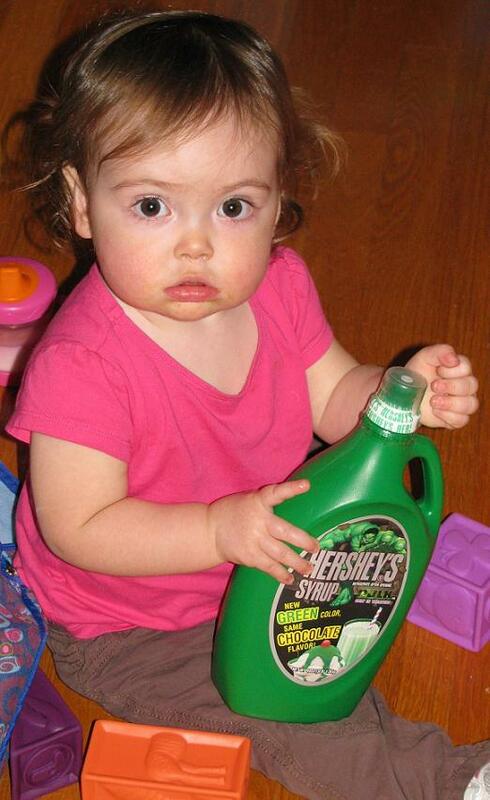 Alexandra and the Bottle of Hulky Syrup! As you can see – the bottle is (sorry – was!) still sealed. My first thought is “who the hell kept a sealed bottle of this syrup for almost a full decade?” But my next tought was just excitement about ripping it open and tasting the green deliciousness! Oh, that’s right – for all of you who did not know – let me explain. 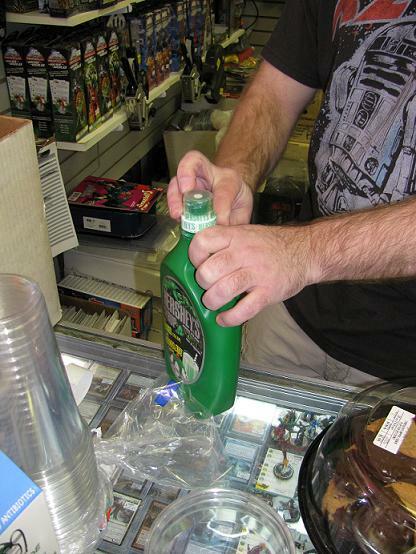 The 2003 Hulk may still remain as one of the most merchandised Marvel movies ever. When the 2003 movie was released the Hulk was everywhere! You could not go anywhere without seeing the green hue of the menacing monster. It was awesome! 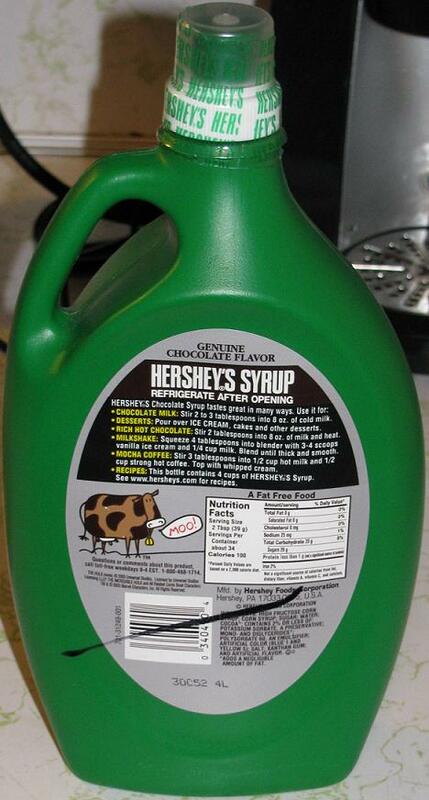 Hershey’s did a promotional syrup for the movie where, instead of the regular syrup turning milk into delicious, brown chocolate milk, this syrup turned your milk into a tall glass of GREEN chocolate milk! Green! And it tasted exactly like regular chocolate milk! 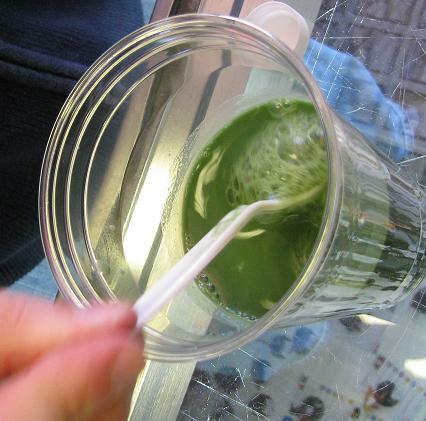 I haven’t had a glass of this treat since 2003 – but there was no way I was going this alone! And I knew there was only ONE person who would want to be part of this moment with me – Corry Brown! 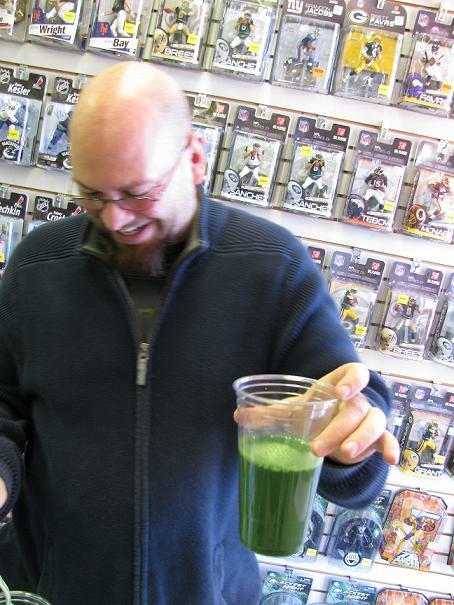 And the perfect setting for our experimental tasting of 7-year-old chocolate milk… was of course ZAPP Comics in Wayne, NJ! I have had a relationship with this store thanks to Corry – and met the owner many times, a great guy named Ben (who was in his own excitement for the holidays – but more business wise than the impending food coma) who chose not to take the green plunge with us – but wished us luck all the same. The Mixing! Look at that Emerald Hue! 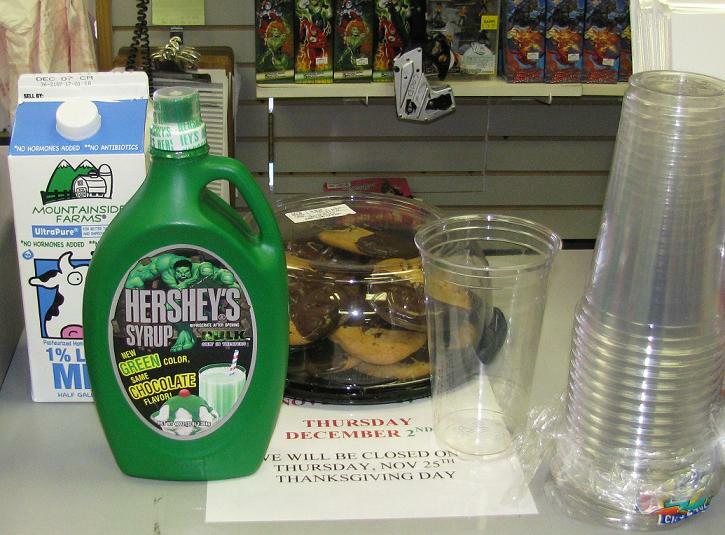 So the moment of truth came – I snagged a half-gallon of milk, a nice batch of cookies and some cups – along with the Hulk syrup and we poured ourselves a nice heaping glass. Funny enough – I like to pour the milk first – Corry chooses to go syrup first. That’s a mistake in my opinion – you should always go milk first – simply because, when you pour the syrup first it clings to the side of the glass, but milk first allows the syrup to sit on the side of the cup! It’s the truth! Try it yourself! Me, laughing at how really gross the milk looks! Anyways – let’s just say the green goodness was as delicious as we both remembered – yet neither of us finished our HUGE glasses of green milk. 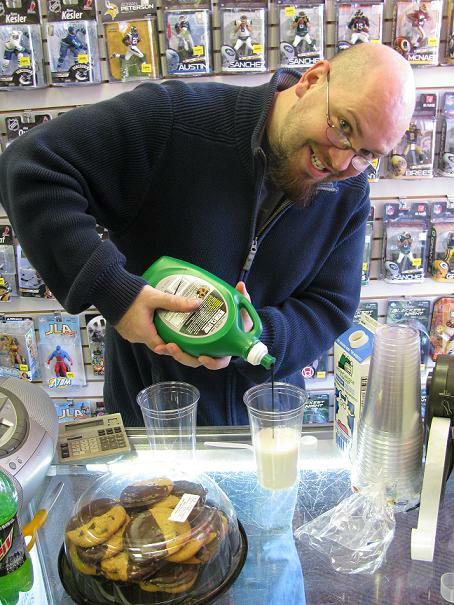 I did get close as I dunked a few cookies into mine – they came out stained by the emerald sludge – but damn they were good! I was also hoping regular site visitor and fellow Hulk enthusiast Gammapup might even stop by – but alas we were not in such luck. 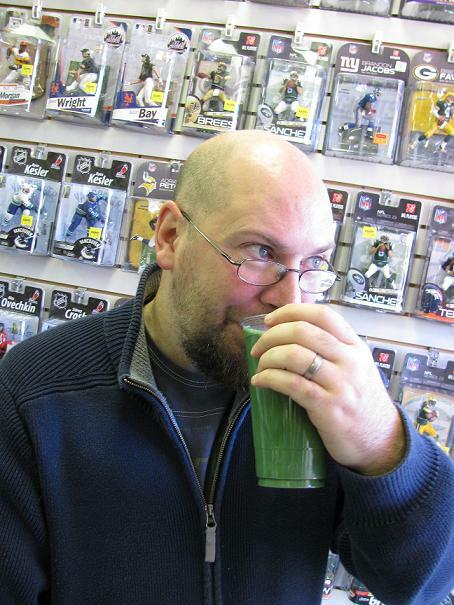 Mike, you should count yourself lucky – Corry and I would totally have made you drink a glass as well! As you could have probably guessed – no new posts this week – taking time for the family and all! I will be back next week to finish off this month with some more RARE pieces. 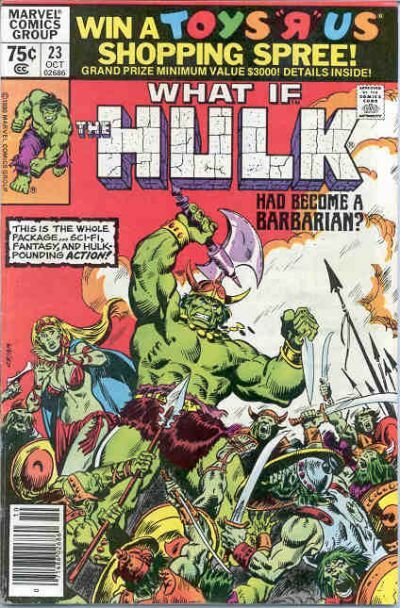 I will tell you – just to get you salivating – a couple more Hulk pages, a couple more Hulk kits, as well as a few more surprises! 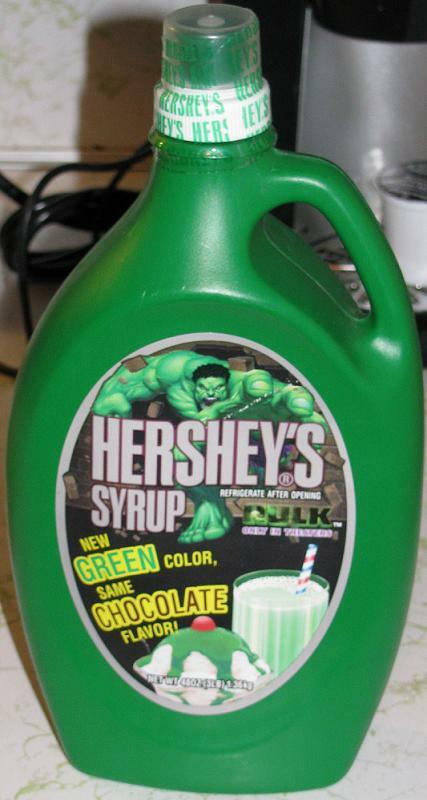 Also – just wait till you see the pics of this: I found an unopened bottle of Hulk Hershey’s syrup on ebay, that’s right – the stuff from 2003! My friend Corry and I will be toasting over our turkey with green chocolate milk! So – apparently the header on the blog has made a little ripple with one particular Hulk fan. The one and only Sean Anderson. If you remember, Sean is an amazing customizer who has shown his amazing work on this site over and over! He asked about the body of what looks like a Hulk statue above… well, sadly, it is not a statue – and even worse – they put a big goofy head on it! But I had the same reaction that Sean did when I took this out of the box. I thought the body was fantastic – but why did they waste the sculpt for a bobblehead!?! It is a heavy, heavy piece – but all the same – it’s a freakin’ bobblehead! This was scored on a trip to a comic shop where I walked into the shop and the person behind me walked in with a box full of stuff to sell – this was in the box. I offered the guy $5 for it before he even had a chance to talk to the owner of the store – and I snagged it! Sorry if this dissapoints you Sean! 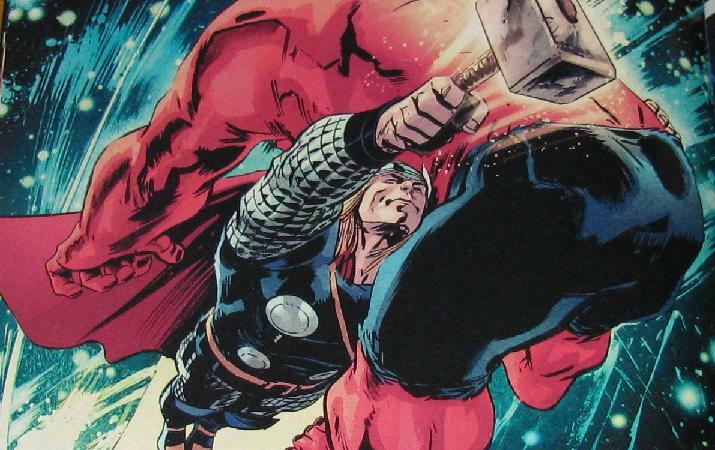 Here comes Thor to save the day! The threat is... a huge eel? Steve and Red head down under the sea, deep, into Namor’s territory. They tell the ruler what is happening and he is ready to jump into action. See, two forces are ready to collide – I can’t remember exactly – I am doing this from memory – but a water source and a heat source are about to meet and that’s bad news. 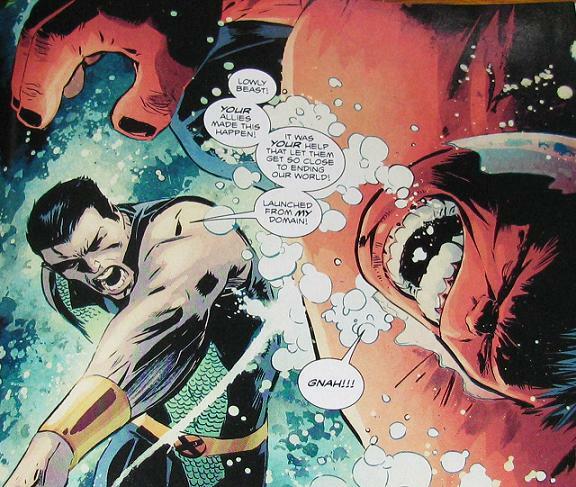 Namor says he will handle the water threat – that turns out to be a huge eel powered by sound. 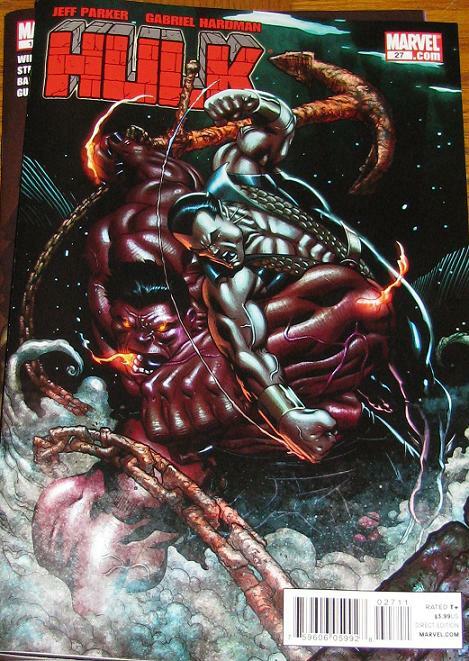 Namor tries to destroy it but to no avail… Red gives him a way to destroy the eel – go inside and get the power source. 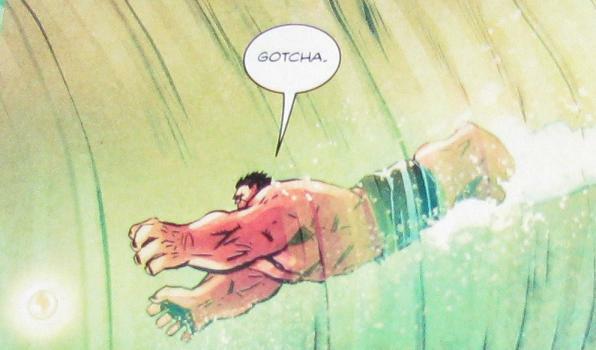 Namor fails. Red comes out of nowhere and snags it instead – just as the heat is coming out of the sea walls! Red stops the lava seeping out as well. His thank you? 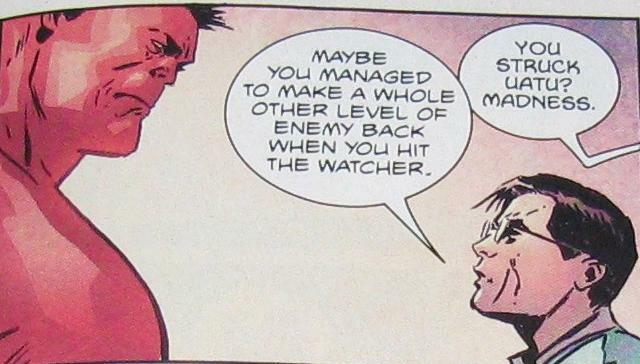 Namor striking him as hard as he can ready to kill him for conspiring with Leader and MODOK to destroy the world. Dun Dun Duuuuuuhhhhhhn! So, the big showdown is here! 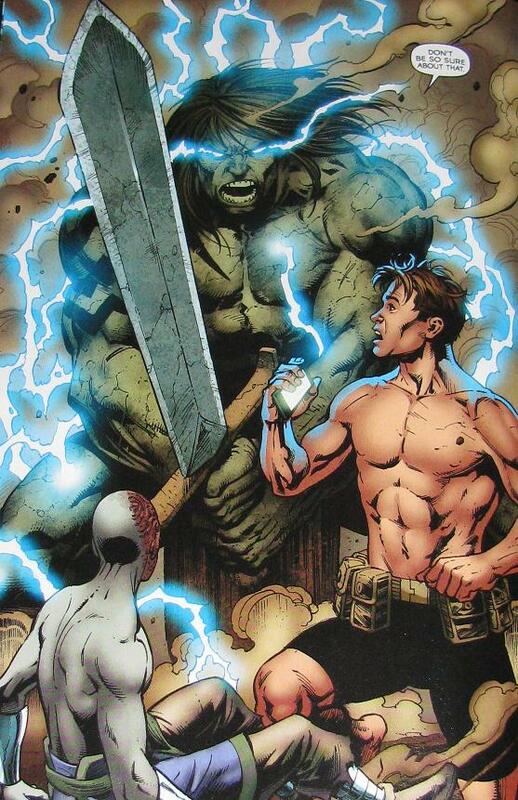 Hiro vs Hulk – Hiro vs Skaar! Can the Hulk’s new family really save the world? Can they stop K’ai from crashing into Earth and killing billions? Can they stop Hiro – someone who seems to revel in making others die? 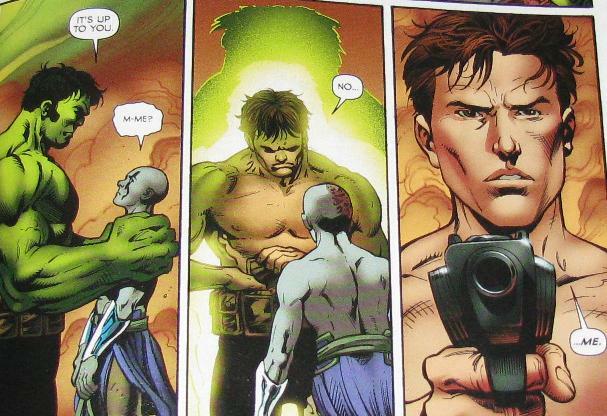 Can the Hulk really kill his son? The answer, surprisingly… and not so surprisingly… is yes. And no. Let me explain – The Hulk is out to save his son – but realizes that he is a monster. He kills the children of K’ai and smiles while doing it. The Hulk tries to knock some sense into Hiro but Hiro returns by blasting him with the Old Power. 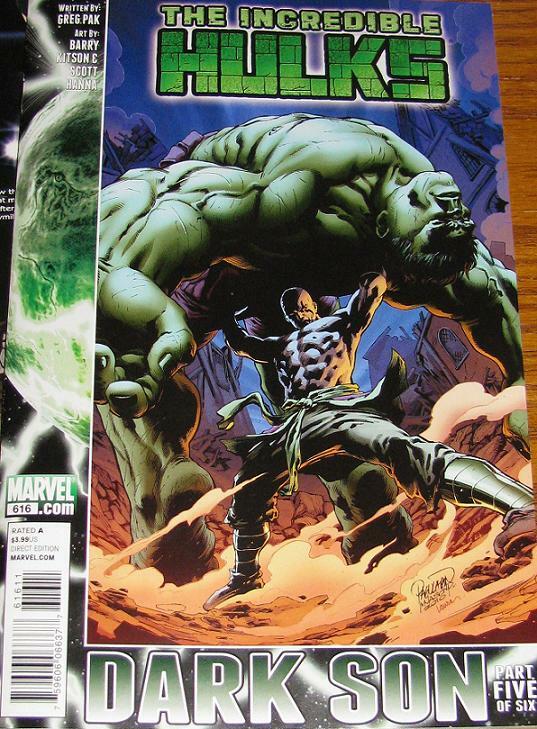 Skaar wants to come and help fight his brother – but the Hulk denies his request – and continues to fight Hiro on his own. 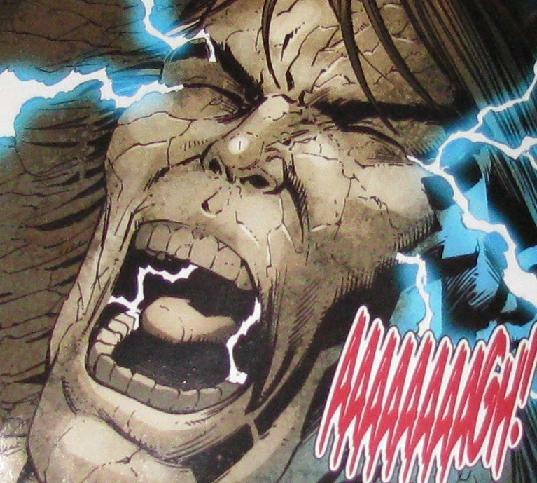 Meanwhile Korg, A-Bomb and Skaar are facing another threat… they have to direct the explosion, but now they also have to try to stop killing the thousands of K’ai people who have been brought to the site. Betty and Jen are facing their own issues. While searching for Hiro’s power they do come across another ally – Axeman Bone – who helps Jen and Betty find the Worldmind. In doing so they discover the Worldmind can also bring the people of K’ai back to life. Now, this is where Skaar takes over. 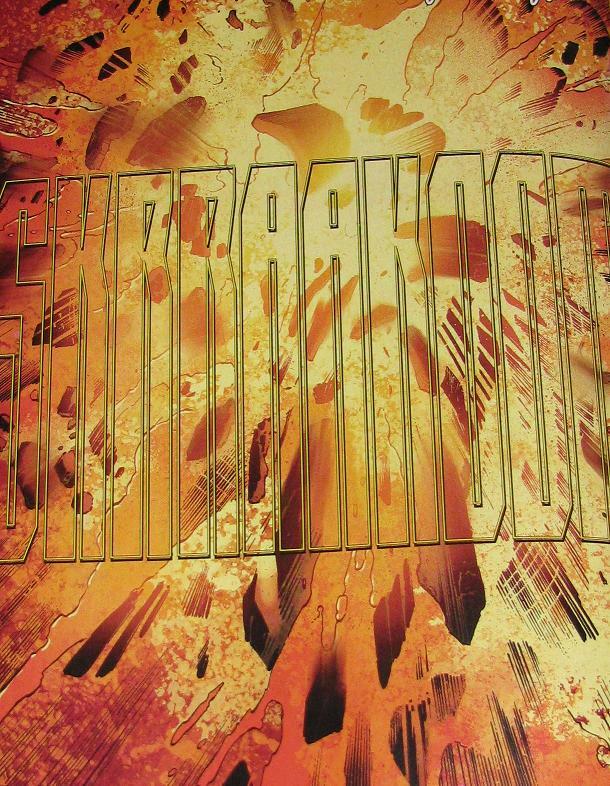 Instead of directing the explosion Skaar tries to contain it. He also stops the planet from hitting Earth. Litterally STOPS the entire planet! He tells his father that he wants to help face his brother – but he’s also not able to hold the Oldpower in and… well, BOOM!